Would you make a good golf pro? Take our career test to find out how you match with this and over 800 other careers. What is a Golf Pro? What is the workplace of a Golf Pro like? A golf pro is someone who earns money by either teaching or playing golf. Golf pros can be anything from the manager of a club or resort to certified coaches who train people of all ages to play golf. One common denominator between all golf professionals is a passion and aptitude for the sport. A professional golfer, on the other hand, is someone who plays golf for a living, playing on major tours such as the PGA tour. Golf pros fall into any of three main professions: touring professional, club professional and instructor. Each profession has its own requirements, responsibilities and degrees of technical skill. Generally, golfers who do not succeed at becoming touring professionals take on positions as club professionals or instructors. All professions call for daily involvement in the sport along with knowledge of correct techniques and the rules of the game. Touring professionals are the professional golfers seen on television, traveling internationally to compete in major golf tournaments. They compete for money and earn additional income from their sponsors. Often touring professionals become famous and can be seen in magazine and television commercials, supporting their sponsors. Only the very best and most talented golfers make it to this level after years of dedicating their lives to the sport of golf. Club professionals are the golf pros who run golf courses. Whether they be country clubs, driving ranges, public courses or resorts, the golf pro is responsible for everything from daily management to course maintenance and giving advice to other golfers on what equipment to use. Club professionals are also responsible for many other managerial duties including accounting, staff supervision, advertising, press releases, keeping track of inventory and scheduling maintenance. In addition, these golf pros are businessmen who are the public face of their establishment. Especially in the case of resort owners, club professionals often host charity events and golf tournaments to raise funds for their communities. Golf instructors work as either independent contractors or are employed with a club, hotel or resort. They are highly successful and technically skilled golfers who have an aptitude for conveying technique and gameplay through verbal instruction and physical demonstrations. They understand weaknesses in a student's game, and will instruct and guide the student in order to make improvements. 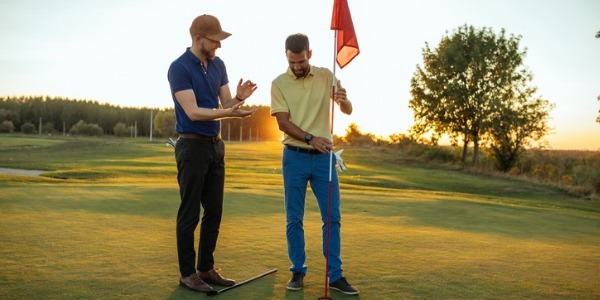 Golf instructors working for a club or resort may also have additional responsibilities including managing assistant instructors, supervising caddies, managing the club's pro shop, and informing the groundskeepers about turf problems. Are you suited to be a golf pro? Golf pros have distinct personalities. They tend to be enterprising individuals, which means they’re adventurous, ambitious, assertive, extroverted, energetic, enthusiastic, confident, and optimistic. They are dominant, persuasive, and motivational. Some of them are also conventional, meaning they’re conscientious and conservative. Does this sound like you? Take our free career test to find out if becoming a golf pro is right for you. Since golf is a game that must be played outside, most golf pros spend a significant amount of time outdoors. The amount of physical activity is higher than that incurred in the average occupation, but significantly lower than in most other sports. In addition to walking and climbing hills, golf pros must sometimes carry heavy bags with clubs and other equipment. For golf pros working in colder climates, work is often not available or severely limited during winter months. Even club professionals who spend most of their time indoors must often close the club during the winter due to a lack of customers. Sometimes, if the facilities are adequate, club managers rent out rooms for banquets, parties and other events.